To ensure the best quality. to the best of our knowledge. at very affordable prices. Width - wide. Office Use. CONDITION : Shoes are pre-owned. COLOR: Black. Color: bone. Heel 1 3/8". Material: leather. 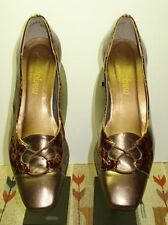 ( 53) Magdesians bronze snakeskin leather square toe low kitten heel pump shoe, 2in kitten heel, faux snakeskin, authentic patent leather, Labeled size 8M and fit like a 8M size, Excellent like new preowned condition.
" 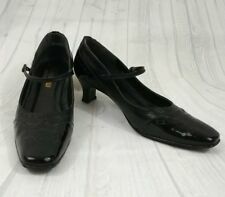 CALIFORNIA MAGDESIANS " 8 1/2 M. BLACK CHECKERS SUEDE AND SHINY - LEATHER UPPERS - BALANCE MAN MADE. These are designer striking in looks! All leather. There is a scratch on the right shoe above the heel. WE STAND BEHIND EVERY SALE 100%. THEY ARE ALL IN GREAT CONDITION. THEY ARE IN EXCELLENT USED CONDITION. THE HEEL IS 2.5" TALL. WOULD MAKE A WONDERFUL ADDITION TO YOUR COLLECTION. Faux Snake -reptile wrapped side vamp and heel. Sophisticated and super cute. Made in the USA and a great look. 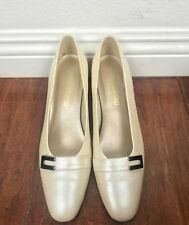 Ivory leather upper with pale yellow croc-embossed vamp. --Soft ivory leather lining. --Nonslip textured rubber sole and heelcap. 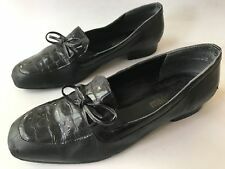 The shoes are in good condition with a few scuff marks here and there they are marked size 8 s may be narrow heel the uppers are leather made in the USA lower sole man made they are off white with yellow trim nice shoes well made .